Twitterati was delighted to see Pakistan escape the whitewash and dominate the opposition. Pakistan finally registered a win in the T20I series against South Africa to end the tour on a high. After losing the first two games of the series, this turned out to be a consolation win for the No.1 T20I side. Shadab Khan turned out to be the difference between both the sides as he was brilliant both with the bat as well as the ball. The Proteas batsmen couldn’t really deliver the required goods. They fell short of the target by 27 runs despite a brilliant fight from Chris Morris. The death bowling also wasn’t great and South Africa surely missed having a player like Faf du Plessis in the middle-order. After being put into bat first, Pakistan was off to a flyer courtesy Babar Azam. The right-hander scored 23 off just 11 balls before he was dismissed. The team was going at over a run rate of 8 till the 10-over mark. However, the South African bowlers surged a brilliant come back with a flurry of quick wickets. From 89/2, Pakistan was down to 94/5 within two overs. At 129/6 after 16 overs and with most of the power-hitters gone, South Africa should have restricted the visitors to a score under 150. They were clearly on the course of doing it until the 19th over. Pakistan’s score was 147/9 at this point in time. But, Shadab Khan was terrific in the last over of the match. 21 runs came off that over from Andile Phehlukwayo as Shadab smashed three sixes. This helped the batting side finish with 168 runs on the board. It was a struggle in the chase for South Africa. Most of the batsmen walked back into the pavilion after putting up minimal scores. Rassie van der Dussen tried to revive the innings but got out at the wrong time after he scored 41 off 35 balls. Chris Morris also tried his level best but lacked support from the other batsmen. He remained unbeaten on 55 off 29 deliveries as South Africa only managed to get 141 runs in their quota of 20 overs. Mohammad Amir looked extremely good and picked up three wickets. 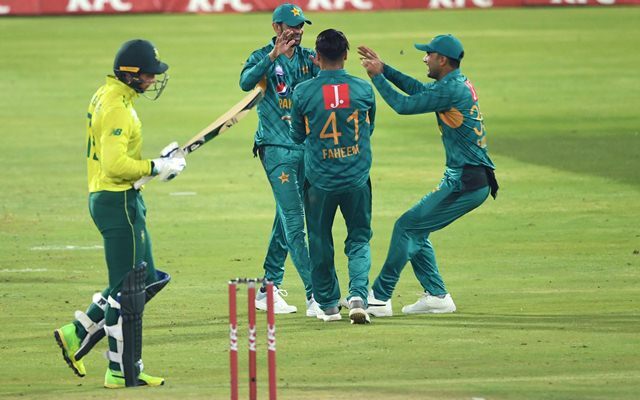 Shadab and Faheem Ashraf picked two scalps each while Imad Wasim and Shaheen Afridi accounted for one each. Twitterati was delighted to see Pakistan escape the whitewash and dominate the opposition. Congratulations for the win, boys. Great effort by the bowlers. Well deserved Man of the Match for Shadab. Keep it up! Many thanks to all at Super Sport: the crew, the producers, the directors and of course the commentators for making it a memorable cricket tour for me. Felt at home and fell in love with the country. Bohat bohat Shukriya. Great hitting by Shadab in the last over taking 21 runs. Three sixes against the best white ball bowler of the tour. In the Test series: 221 runs in 6 innings at an average of 36.83. In the ODI series: 195 runs in 5 innings at an average of 48.75.